It is said that when a representative of the Martel Company brought the first samples of Jelly Moss, or Ogre Snot, back to Banuvo's College of Mysteries, it nearly caused a riot among the academics. 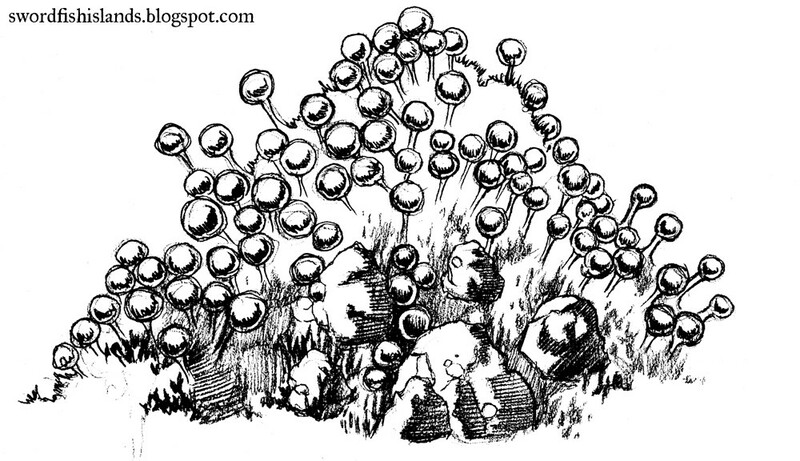 The resident sages were unable to conclusively determine if this clump of grayish-purple tube-like structures, smelling a bit like rotten pears was a plant or a fungus. The faculty became divided. Sides were taken, venomous rhetoric was exchanged, and longstanding friendships were laid to waste. Then, at the very peak of what became known as "The Semester of Slime" Professor Smithwick inadvertently discovered a use for the stuff when he sat down on a sample and his robe became fused to his wooden chair. It was known that Jelly Moss, when crushed, becomes very messy and sticky, but despite all the arguments and investigation, no one had realized this goo would create and almost instant, permanent, bond of incredible strength with wood. The battle of classification now transformed into a full blown war between the Blacksmith's Guild and the Carpenter's over the future of nails.